Exterior view of the gateway to Akbar's Tomb, Sikandra, Agra. bl.uk > Online Gallery Home	> Online exhibitions	> Asia, Pacific and Africa Collections	> Exterior view of the gateway to Akbar's Tomb, Sikandra, Agra. This photograph shows the southern gateway to the tomb complex of the Mughal emperor Akbar (r. 1556-1605) at Sikandra outside Agra taken from the south-west. It was taken by W Caney in the 1880s. 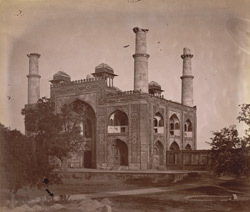 It has subsequently been restored including replacement of the upper parts of the minarets which in this photograph are partially ruined. The gateway comprises a high central arched entrance or 'pishtaq' flanked by smaller arches on two storeys. It is faced in red sandstone with white marble on the minarets above. The red sandstone surfaces are decorated with both inlaid and tessellated coloured marble mosaics of floral arabesques and geometric panels. Although the gateway is largely Persian in style, the four square domed kiosks on the roof are derived from local architectural traditions. This combination of architectural styles mirrors that of the mausoleum contained within the complex, which is a unique fusion of traditionally Hindu and imported Islamic forms. This catholic approach to architectural style is often cited as an indication of Akbar's own tolerant views and interest in a wide range of religious philosophies.